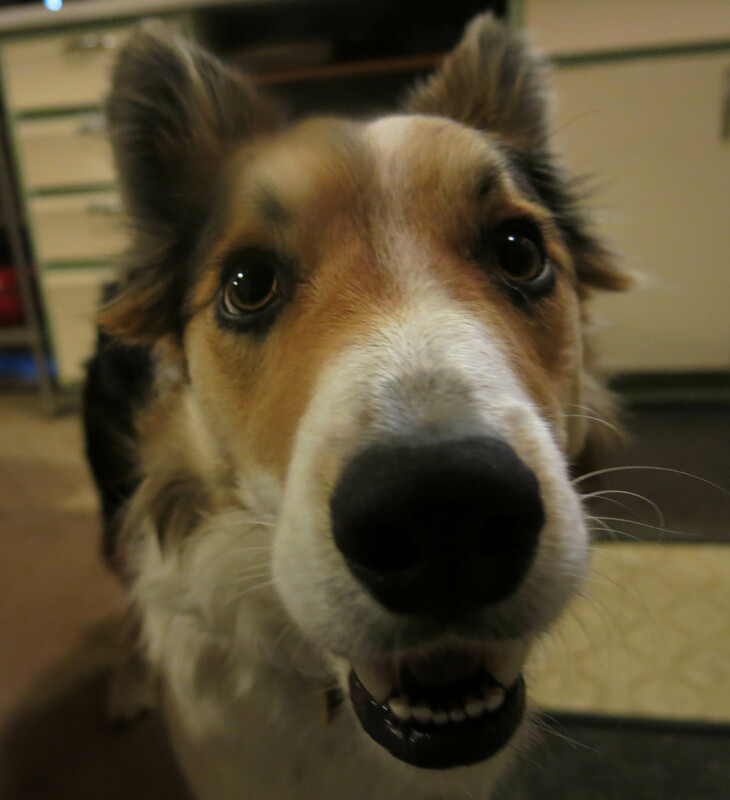 Greetings and salutations, everyone; yes, once again it is I, Mani the somewhat small, yet not totally miniature, purebred border collie, filling in for the guy I live with, and here to bring you up to date on the news from our garden. You may remember me from such posts as “One Hundred Snowdrops”, among so many, many others. Here I am in a characteristic pose. I realize it’s been a while since I posted, but that’s because it’s been “so horribly icy” that the guy I live with has been all discouraged and bent out of shape. Even though I got another excellent report card at Day Care, just like I did the week before that, he still complained about the ice. I didn’t. I guess I’m just excellent, and that’s all I can say about that. I mostly did things like this while he complained about the ice. But as he keeps telling me, everything changes, and things have indeed changed here. 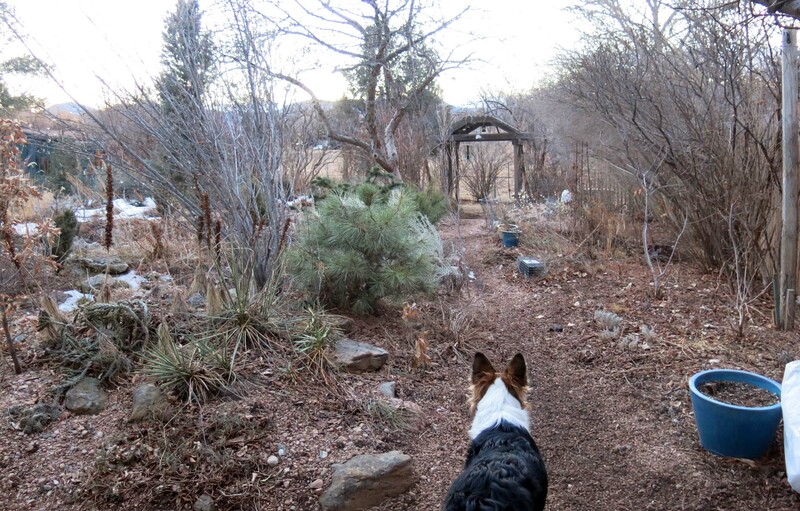 The guy I live with remarked today that the garden was “mostly iceless”, and in fact, the last four walks have been the best, and least icy, in the last sixty-eight days. This is a sunset picture, as you can maybe tell. It’s been sunny and warm here since I last posted, even though the paths, and a lot of places on my walks, were treacherously icy. The guy I live with now has a pair of those ice trekker deals that fit on his shoes. His friend gave those to him. I didn’t get any, but that’s because of my totally superior coordination. 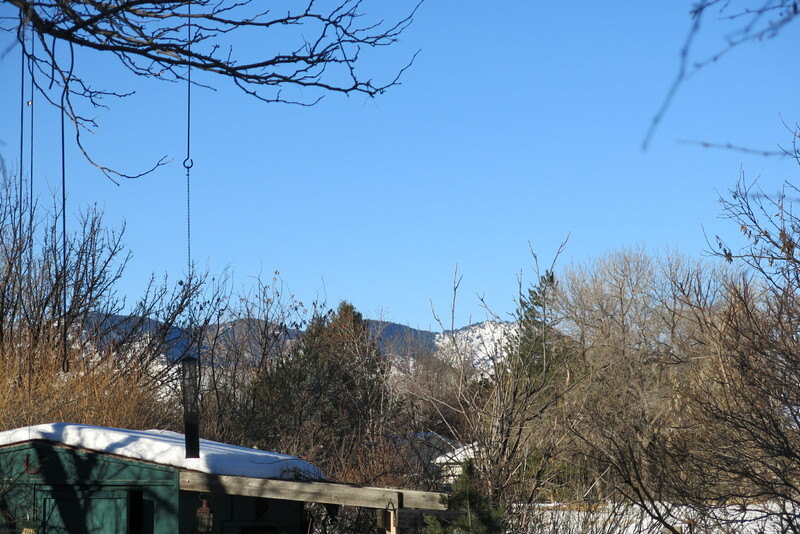 Here’s a picture taken from the back yard on a sunny morning. 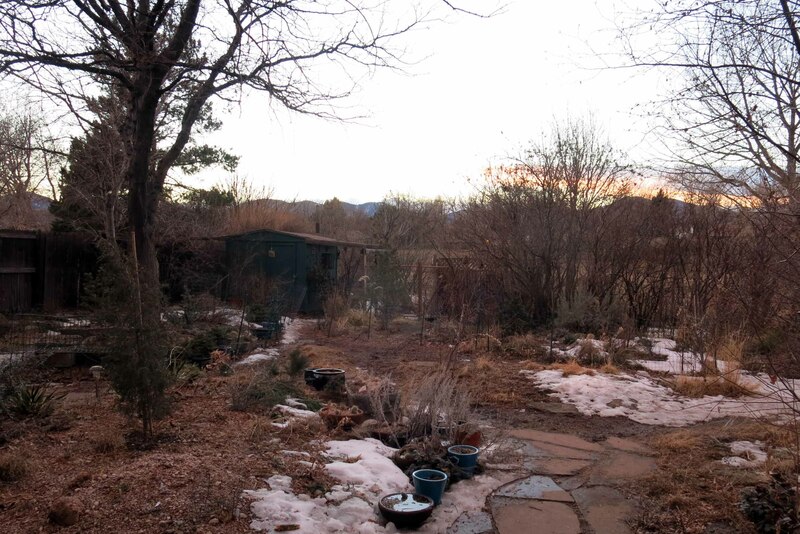 But now, almost all the snow, or what the guy I live with calls “the white horror”, is gone, and the garden is, in fact, mostly iceless. Things are still delightfully muddy, though. You may not believe this, what with me being a purebred border collie and all, but I do like a bit of mud, especially if I can track it into the house. It’s especially good to do it right after the carpet has been shampooed. Well, of course, to the guy I live with, none of this would mean anything at all, except maybe more complaining and sighing and moaning and groaning, but look what’s happened in just the last few days. That’s a chunk of dirt in the picture above, by the way, and not….anything else. Today is Valentine’s Day, of course, and his friend came over (the guy I live with said not to give her a velociraptor chomp, and so I tried not to). 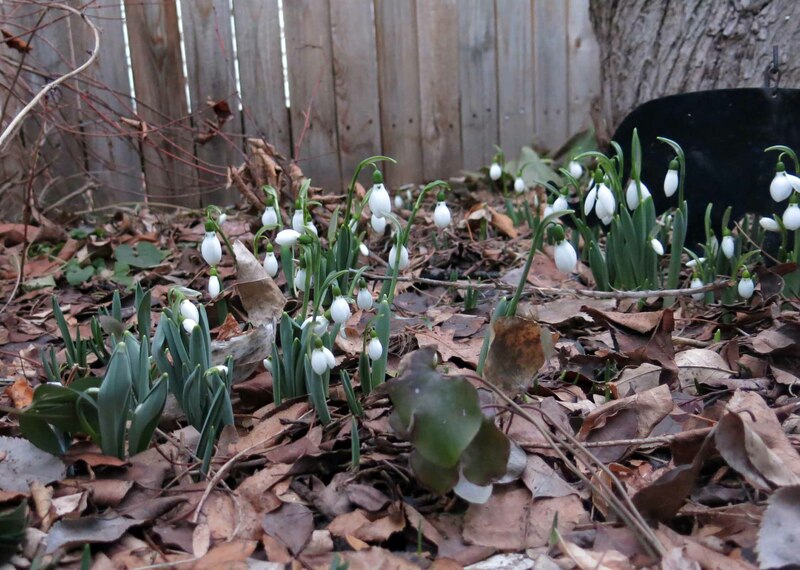 They went out for sushi, but not before he showed off his snowdrops to her. There isn’t anything that spells a relief from the clutches of winter like bunches of snowdrops. “Look”, he said, “snowdrops”. He’s pretty eloquent. I got a “bully stick”, to chew on, and a new blanket for my downstairs fort. These snowdrops here sowed themselves. Well, ants did the real work. 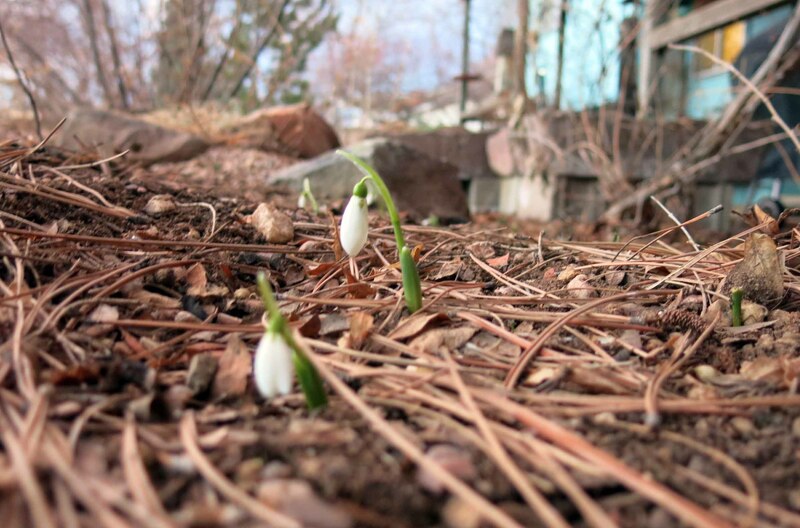 And remember the “one hundred snowdrops” that were planted last fall? Here they are. Not all one hundred of them, of course, but some of them. The guy I live with said (yes, I know, I couldn’t believe my ears) that we had to be patient. 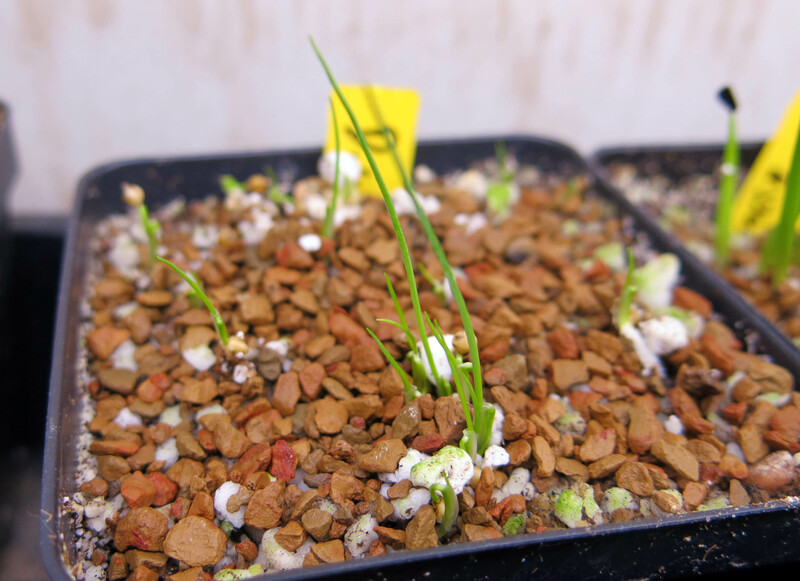 There are also some things coming up from seed. The dasylirions, for instance. So that’s pretty much it. Mostly iceless, and snowdrops. 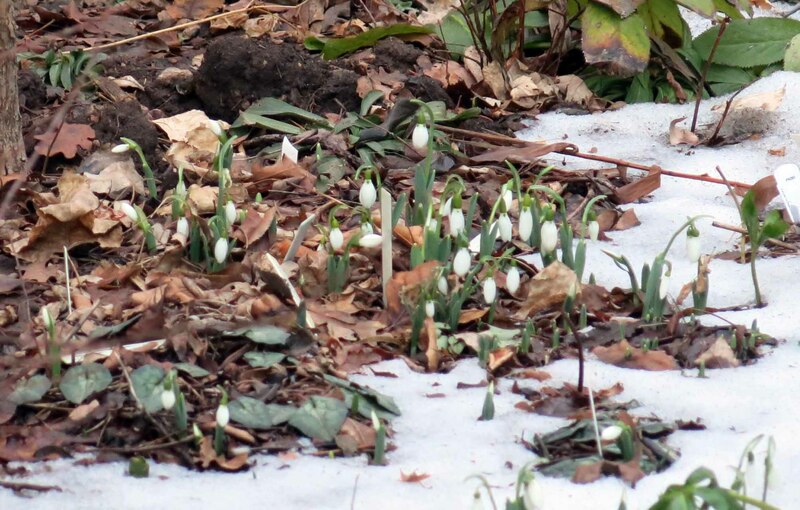 Of course the guy I live with had to say something about the snowdrops being “later than usual”, but never mind that. I’ve been able to walk all the way down the creek path four times in a row now; that is, twice a day, and that’s the best thing of all. I’ll let you go now, with another picture of me. Mostly iceless is an excellent way to experience Valentine’s day. Or any weekend. Or week day. We have millions of snowdrops. Real snow. And ice. And no seedlings to remind us of spring. The guy I live with would “super definitely” agree. 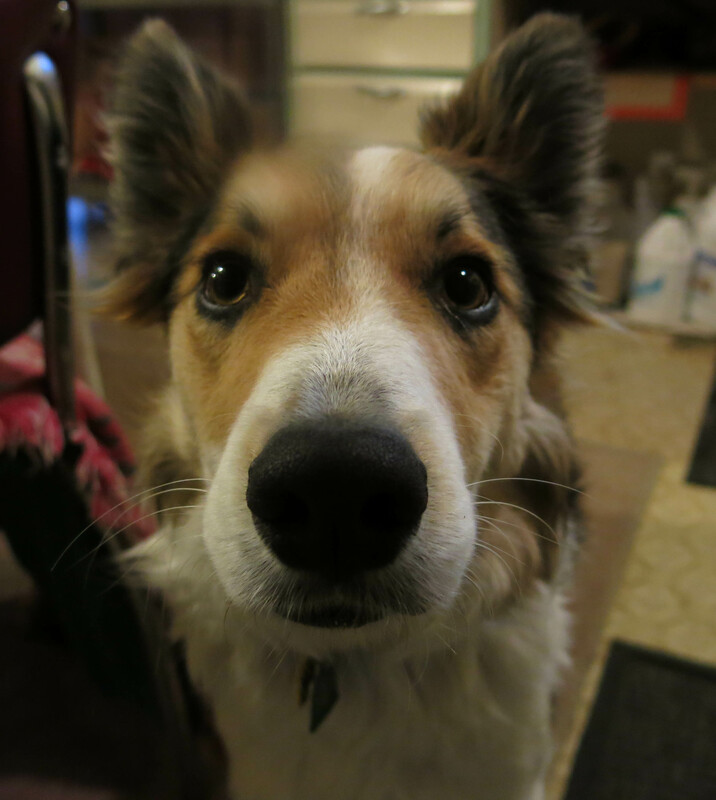 He says he’s sorry you have to endure all the snow and ice. He saw me run out in back, going down the path by the shed, several days ago, and I slipped, but just kept on going. He would have fallen on his face, and lain there for days. Nights are going to be above freezing for the next week or so, and so he’ll have to find something else to whine about. Surely there will be something. Dasylirions seriously. The guy I live with says you’ll have to look at the blog for the next ten years before the plants go out into the garden. He’ll be too old to plant them then. Thanks; the guy I live with wanted to call the post “nicely iceless” but I didn’t want to. He says he’s never seen so much ice on the ground for so long, but that ice is nicer than mice, which incidentally I’ve seen, on the patio, twice, or thrice, but they skittered away in a trice. The guy you live with’s friend, Mani, gives good gifts, sounds like. I’ve always thought iceless is a condition for which to devoutly hope, so all seems to be going well, what with the glorious sunset mountain view and excellent walks. The snowdrops, of course, are nice enough, popping through both ice and iceless. Because I read The Garden, magazine of the Royal Horticulture Society, I understand how some folks go gaga over snowdrops. Really gaga. The dasylirions are cute, you have quite the array of toys, and, mostly, happy Valentine’s Day. Air smoochies out to you, Mani. Thanks. That is quite an array of toys, isn’t it? 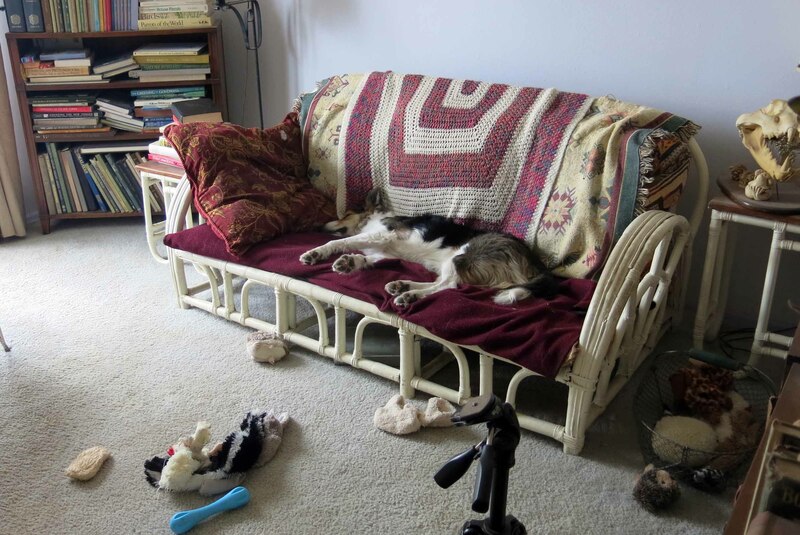 The guy I live with claims that the late Chess, who was here before me, used to put his toys back in the basket there, but I can’t really do that, because I need to be surrounded by a lot of them. It’s just a thing, if you know what I mean. Yes, people do pay zillions of dollars for a single snowdrop bulb, and they have Snowdrop Days, to snowdrop gardens, and snowdrop sales, and snowdrop this, and snowdrop that. The guy I live with says that that sort of white is infinitely preferable to any weather-related white. mani ~ thank you for posting the photos of the snowdrops!! they made me feel so HOPEFUL, while outside here temperatures just got into double digits (finally!). our snowdrops won’t show for another couple of weeks, but you gave me some relief from my ‘can’t wait for spring’ blues. Why, you’re welcome. The guy I live with says that we still have many more weeks of snow to come, but the respite is nice. I noticed the lots of toys. Glad to see the snowdrops and glad about the sushi dinner! Thanks, yes, the lots of toys are really excellent. They all got washed, and put in the basket, and then they had to be taken out, you know, to kind of like be inspected, to make sure they were still all there, and I guess they were. Of course, the guy I live with is now complaining about “rot”, from the snow lying on the ground for so long. “Rot, rot, rot”, is what he says. At least, sometimes. I stop listening after a while. Greetings from the Maritime Alps! 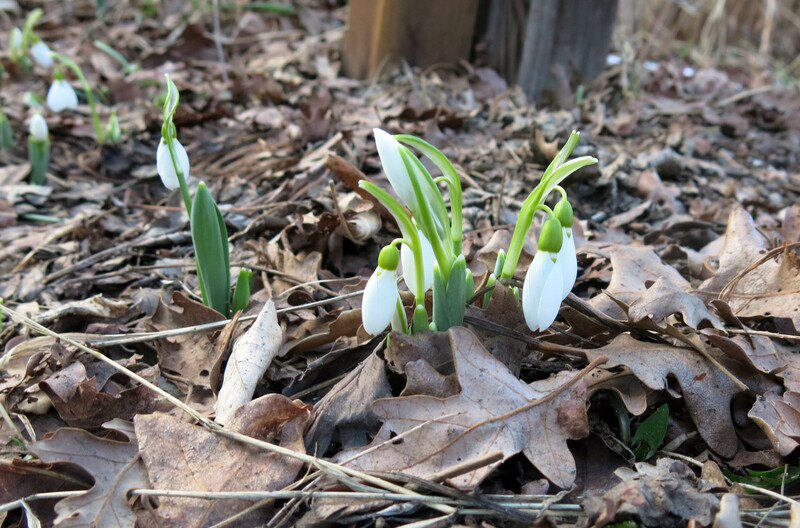 here too bloom Galanthus nivalis L.
Greetings! Yes, we like them very much.